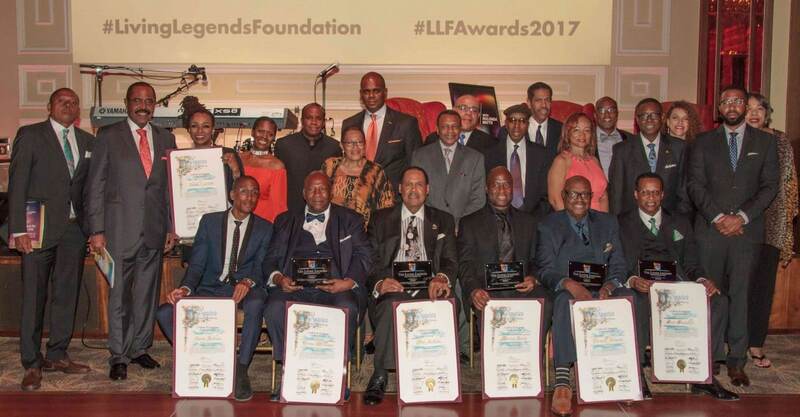 (Los Angeles, CA – October 16, 2017) — The Living Legends Foundation,® Inc. (LLF), recently celebrated its 26th Anniversary at the Taglyan Cultural Complex in Hollywood. 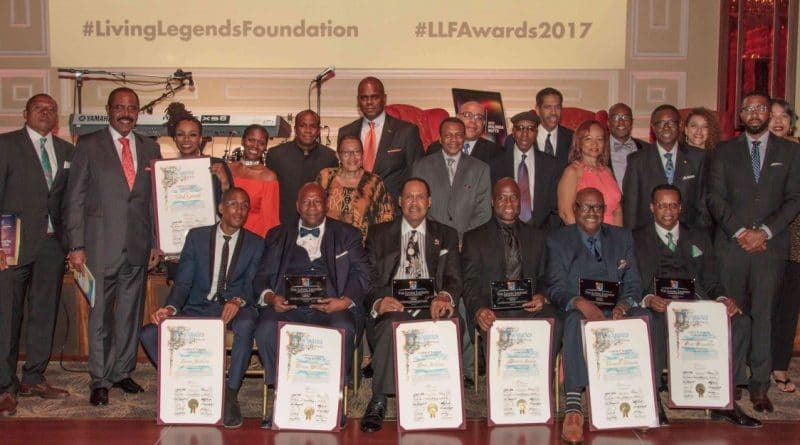 Hosted by veteran broadcaster and media personality Rolonda Watts, the LLF honored eight distinguished individuals at its 21st Annual Living Legends Awards Gala with its new late-night format. The 2017 honorees included Varnell Johnson, LLF President and CEO of Junes Entertainment, who was presented with the Chairman’s Award by LLF Chairman David C. Linton. Don Jackson, founder, Chairman, and CEO of Central City Productions, Inc., received the Broadcast Icon Award, presented by Jalila Larsuel; Ray Chew and Vivian Scott Chew, Partners of Chew Entertainment were presented with the Creative Visionary Award by LLF General Counsel Kendall Minter; Morace Landy, Chief Marketing Strategist of Empire Distribution received the Music Executive Award by Ghazi Shami; Steve Crumbley, Senior Vice President of Programming/Operations Manager of Apex Media Charleston was presented with the Jerry Boulding Radio Executive Award by radio personality Jay Michaels; Tyrone Williams, Chairman of the Board of Brooklyn United and former CEO of Cold Chillin’ Records received the Hip-Hop Visionary Award, which was presented by his family Brittany Williams, Tyrone Williams, Jr., and William Ashbourne; and Larry Jackson, Head of Original Music Content of Apple Music was presented with the Digital Music Executive Award by Jon Platt, LLF board member and CEO/Chairman of Warner Chappell Music. This year’s LLF Honorary Event Chairpersons included Geo Bivins, Executive Vice-President, Urban Promotions of RCA Records, and Siedah Garrett, Grammy Award winner and two-time Oscar-nominated singer, songwriter, and producer. Patricia Shields, Partner of Black Dot, LLC, and LLF Officer, served as Dinner Committee Chairperson. The LLF Dinner Committee included an esteemed group of executives from radio, records, and media, including Eulis Cathey, Radio Personality of Watercolors, Sirius XM and WBGO-FM; Skip Dillard, Program Director of WBLS-FM (New York), and LLF Advisory board member; Sheila Eldridge, CEO of Miles Ahead Entertainment & Broadcasting, and LLF board member; Ethiopia Habtermariam, President of Motown Records; Karen Kennedy, President of 24 Seven Artist Development; Vicki Mack Lataillade, CMO of Premiere Label Group; Pat Prescott, Radio Personality of 94.7/The Wave Radio; Lynn Scott, Vice President, Marketing of Warner Bros. Records; and Phil Thornton, Senior Vice-President/GM of RCA Inspiration/Sony Music. Sponsors for the 2017 LLF Awards Dinner and Gala included Warner Chappell Music, Empire Distribution Group, RCA Records, Apple Music, All Access Music Group, Atlantic Records, City National Bank, Columbia Records, Def Jam Records, REVOLT Music, eOne Music, Epic Records, RCA Inspiration, Warner Bros. Records, WU Music, Nicole Avant, and Universal Music. 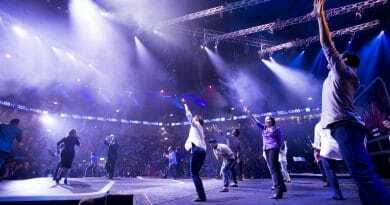 Media sponsors included EURWEB.com, Moses Media, Music Industry, Quarterly, RadioFacts, and The Urban Buzz. This year’s gifting sponsors provided a variety of donations for honorees, celebrities and VIP guests including 37Ink, Atria Books, Black Momma Vodka, Concord Music Group, Enliven, Glamazon Beauty Cosmetics, HBO, Jane Carter Solution, Johnson’s Popcorn, Khuraira Cosmetics, Mack Avenue Records, Miss Jessie’s Original, Motown Gospel, Nelson Books, RCA Inspiration, Revel Spirits, Roslynn Wright, The Sitoto Collection, and Warner Bros Records. The LLF gifting sponsors also provided numerous book titles including copies of Long Road To Hard Truth by Judge Wilkins, which were given by an anonymous donor. Actor Wesley Snipes and Monica Wood donated books of Snipes’ new novel, Talon Of God; new author and award-winning songwriter Taura Stinson gifted copies of 100 Things Every Black Girl Should Know; and author Monika M. Pickett provided books of her debut novel titled, Little Boy Blue. Gift bag sponsors for the general guests included the LA Dodgers, Fox Sports, ASCAP, Breath of Life Records, Empire Distribution Group, D3 Entertainment, and the American Heart Association. The Living Legends Foundation,® Inc. is a registered 501 (c) (3) non-profit, tax-exempt organization and has been funded primarily with corporate contributions and individual donations. The 26-year-old organization has expanded its mission to provide assistance to those who have served the music industry and who have a confirmable need. This assistance is provided in a manner that maintains the dignity of those who may receive financial help. 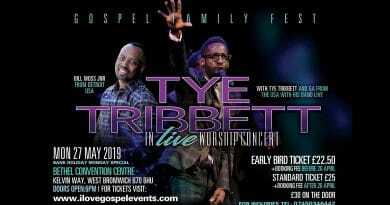 Proceeds from the event will enable the LLF to continue to aid those in need, as well as the Living Legends Foundation Scholarship Program, which helps the educational pursuits of the next generation of music makers and marketers at three HBCUs. ← Making Sense of Mercy, Justice, Forgiveness and Revenge.